Continuous and Categorical outcomes (Binary, Ordinal and Nominal) are usually the most common types of response observed in Epidemiology, Public health, Social and Behavioral sciences. We have a range of regression methods like, Multiple Linear, Logistic, Ordinal and Multinomial regression to handle those types of outcomes. However, many times, the responses are also observed as counts in epidemiology and clinical epidemiology. These counts are inevitable in Infectious disease epidemiology. Mostly the hospital and government surveillance system deals with counts rather than continuous or binary outcomes. A count is “number of times an event occurs” such as cholera counts reported per week per locality or from a microbiology department. Many times, count data are handled by categorizing, that is, dichotomized (event, no event) or made ordinal (low, medium, and high frequency of events). This practice, deals with power loss. Count response models are discrete response regression models. Generally counts are intrinsically not homogeneous, right skewed, with variance that increases with the mean of the distribution. Models like Poisson and Negative Binomial regressions are used and are appropriate in such scenarios. The most common problem in any count data is the over or under dispersion. Another problem that is encountered is due to Zero counts. That is, either data may have more or less number of zeros. There are methods to identify over or under dispersion and handle those zero counts. Censoring and truncation are other issues in count data as well. All the above concerns need to be addressed cautiously and appropriate decision needs to be taken to handle them. This course will address all the above specified issues and help in choosing an appropriate model with examples, lectures, practicals and journal critique. 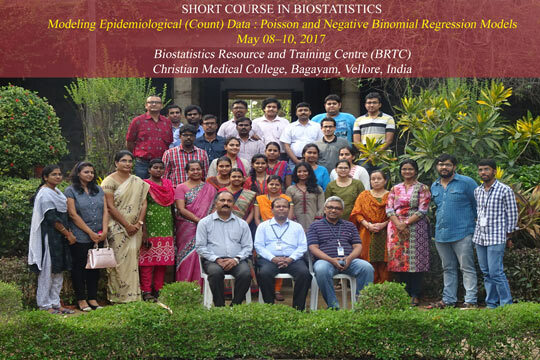 This course is useful to medical and allied health professionals, researchers, Biostatisticians / Statisticians and Epidemiologists. The methods covered in this course are very well handled using STATA (Menu Driven Options). Data sets used in the course will be made available in STATA and Excel. However, R codes will also be given.